It's been quite a while since I last talked about hair care. I've been mostly sticking to the same routine and rotation of products as I tend to take a long time to finish things off, but when I spotted a limited edition hair care discovery box at Naturisimo last month I figured it would be the perfect opportunity to try something new! The box was a bargain at less than £10 for over £20 worth of products from John Masters Organics and Rahua (I haven't got around to trying the Rahua products just yet). I've tried a couple of sample sachets from John Masters before, but it can be hard to decide if you like something after just one use. I much prefer testing travel sizes as you can use them for a lot longer - these 60ml bottles lasted me about a month. The Lavender Rosemary Shampoo is pH balanced and designed for normal hair. The key ingredients are, of course, lavender and rosemary which are known for slowing hair loss and stimulating follicles to promote hair growth. I was pretty impressed with how well this shampoo works for me. I don't feel the need to double wash like I have to with most of the natural shampoo I've tried and it lathers up well. I've noticed less flyaways and more shine to my hair, and more importantly it's kept my fussy scalp happy! One thing I'm not too keen on is the scent, but it's not a big issue as it doesn't seem to linger. A full size bottle is more expensive than I normally go for, at £16 for 8oz/236ml, but the cost would balance out over time as it would last around 4 months at the rate I've been using it. I'll definitely consider picking up a bottle next time I need to stock up on shampoo! The Citrus & Neroli Detangler didn't impress me as much unfortunately. The citrus scent is right up my street and I did notice slightly more shine to my hair, but it didn't make any difference at all in terms of tangles for me. I know a lot of people love this conditioner, so I think the problem is that it's just not right for my hair type. It's very lightweight, so even as a leave-in treatment it wasn't enough for the dry lengths and ends of my hair. I can imagine it would be absolutely perfect for fine hair though! A couple of their more hydrating products sound ideal for my hair type - I have my eye on the Lavender & Avocado Intensive Conditioner or the Honey & Hibiscus Hair Reconstructor to try next! 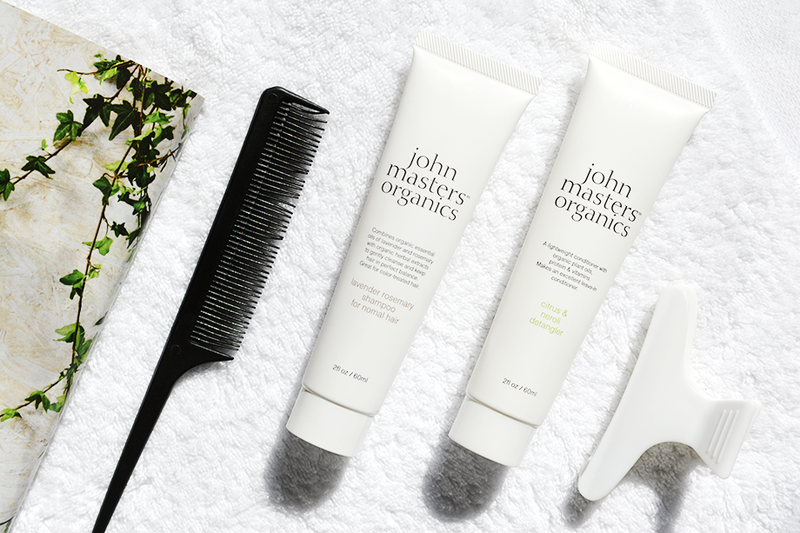 Have you tried anything from John Masters Organics before? Ah such a shame you didn't like the Neroli Citrus Detangler, I love it! Definitely want to try more from JM, this box was a great deal!